Have a question about Biolimão Gold? What is it, what does it do, how and when to use or something else? Ask us. Take one capsule twice a day, 15 minutes before your two main meals (lunch and dinner). 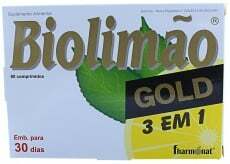 WARNINGS Biolimão Gold : Contains lactose. Do not exceed the recommended dosage. Do not take if you are hypersensitive to any of the ingredients. Store at a temperature not exceeding 25°C in cool dry place away from sunlight. Keep out of reach of children.